It will be an unforgettable experience that you don’t want to miss. PSAR will present its 2019 Officers and Directors Installation Dinner on Friday, Nov. 9, at the Admiral Kidd Conference Center, 33050 McDonough Road, San Diego, 92136 (some GPS devices may show the address as 33050 Acoustic Ave.). Bigger and better than ever, this year’s Installation Dinner is destined to be the biggest real estate event of the year, as we welcome the 2019 board of directors in this exclusive venue. Located on military property on Naval Base Point Loma at the Harbor Drive Annex, the Admiral Kidd Conference Center is virtually surrounded by the splendor of the San Diego Bay and downtown skyline and offers breathtaking views of the San Diego Bay. The facility features a lovely lawn setting and a deck overlooking the bay. The installation event will celebrate success in the REALTOR® community with the top producers in the industry. The program will feature the swearing in of the 2019 PSAR board of directors including Robert Calloway as 2019 PSAR president. Also announced will be winners of the East County Realtor of the Year, South County Realtor of the Year, East County Affiliate of the Year and South County Affiliate of the Year. Additional awards will include Broker-Office Manager of the Year for both East County and South County. Don’t be late. Networking with colleagues and industry peers will start at 6 p.m. Stella Artois premium beer and wine (Chardonnay and Cabernet Sauvignon) will be hosted. This will be your opportunity to reconnect with old friends and engage with new friends, raising your profile, expanding your influence, telling your story and generating referrals and greater business. Dinner will begin at 7 p.m. Farmer’s table appetizer display will include assorted cheese and crackers and veggie display. Hors-d'oeuvres will be passed. Hors-d’oeuvres will include fresh roasted tomato bruschetta, smoked salmon and cucumber roulade, bacon wrapped scallops and beef empanadas. Plated dinners choices will include chicken Marsala (breast of chicken simmered in rosemary Marsala wine sauce), grilled New York steak (with carmelized onions and a rich bordelaise sauce) or vegetarian (pasta primavera). Chardonnay and Pinot Noir wine will be served with dinner. Tickets are priced at $85 per person, which is a tremendous bargain. RSVPs can be made at blog.psar.org/installation. Sponsorship opportunities are still available for this special night. Several different affordable sponsorship opportunities are currently being offered. This is a prime advertising opportunity to situate your brand in front of other industry professionals and get the attention your brand deserves. More sponsorship information is available by contacting Sally Valdez at PSAR at (619) 579-0333. 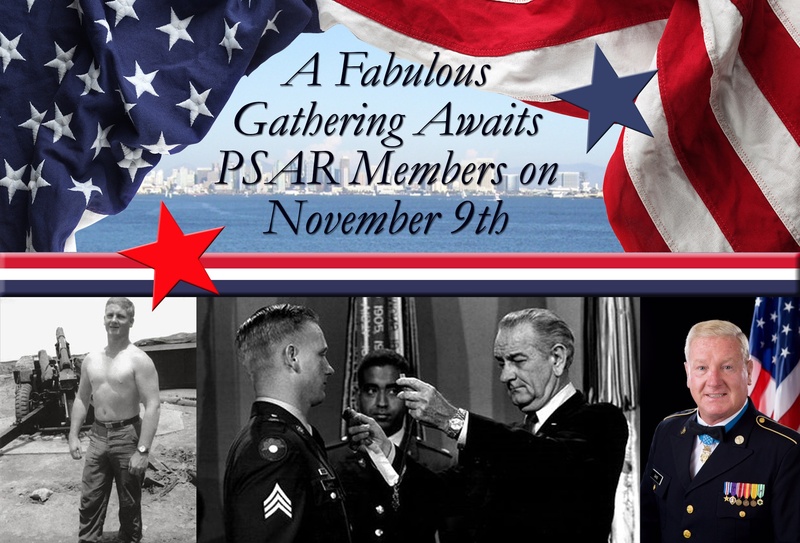 Special guest speaker at the PSAR Installation Dinner will be Sammy Lee Davis, a veteran who served in the U.S. Army during the Vietnam War and was awarded the nation’s highest military medal for valor, the Medal of Honor. Davis took some ribbing in the Army because he shared a name with the famous entertainer. Much later, long after his military days were over, he would again gain some acclaim among his old comrades, this time as the “real Forrest Gump.” That’s because news footage of Davis receiving the Medal of Honor from President Lyndon B. Johnson appeared in the 1994 “Forrest Gump” motion picture with Tom Hanks’ head in place of Davis. Gump’s functional Medal of Honor citation was loosely based on Davis’ real one. Early on November 18, 1967, his unit of 11 guns and 42 men were transported via helicopter into an area west of Cai Lay to set up a forward fire-support base. Shortly after midnight the next morning, Private First Class Davis’s Battery C came under heavy mortar attack. Almost simultaneously, an estimated 1,500 Vietcong soldiers launched an intense ground assault, failing to overrun the Americans only because a river separated the two forces. Davis’s squad was operating a 105 mm howitzer that fired 18,000 beehive darts in each shell. When he saw how close the enemy had come, Davis took over a machine gun and provided covering-fire for his gun crew. But an enemy recoilless rifle round scored a direct hit on the howitzer, knocking the crew from the weapon and blowing Davis sideways into a foxhole. Convinced that the heavily outnumbered Americans couldn’t survive the attack, Davis decided to fire off at least one round from the damaged artillery piece before being overrun. He struggled to his feet, rammed a shell into the gun, and fired point-blank at the Vietcong who were advancing five deep directly in front of the weapon; the beehive round cut them down. An enemy mortar round exploded nearby, knocking Davis to the ground, but he got up and kept firing the howitzer. When there were no more rounds left, he fired a white phosphorus shell, and then the last round he had a “propaganda shell” filled with leaflets. On Nov. 19, 1968, exactly one year and one day after the nightlong firefight at Cai Lay, Davis received the Medal of Honor from President Lyndon Johnson. Davis is the author of “You Don’t Lose ‘Til You Quit Trying: Lessons on Adversity and Victory from a Vietnam Veteran and Medal of Honor Recipient.” The book is available on Amazon.